Even the most repressed woman has a secret life, with secret thoughts and secret feelings which are lush and wild., that is, natural. Even the most captured woman guards the place of the wildish self, for she knows intuitively that someday there will be a loophole, an aperture, a chance, and she will hightail it to escape. When I was a child, I would dream of brief cases, commutes, and travel coffee mugs. I would find myself whipped up into a lather contemplating 401Ks and benefits. I was the kind of child that dreamed of a stable income and a 9 to 5 job. Because a stable income and health insurance meant safety, and, above all else, I wanted to be safe. I wanted to build a life that I could trust in – a life where there weren’t many surprises and I felt delightfully competent. I dreamed of the simplicity and ease of it all. Someone else to tell me what to do – and me, doing what I was told well enough that I rose through the ranks of my dream organization. And so, I put one foot in front of the other, working my way through my undergraduate and graduate degrees, readying myself for the day when I would suddenly understand business casual clothing, possess the right footwear, and begin. It was 6 am and I was in a hotel in Vermont in January. As I woke up, my eyes were scratchy, swollen from having cried all night long the night prior as evidenced by the mountain of tissues on my bedside table. I can’t keep doing this, either. Mara, if this was the last year of your life, what would you do with it? I wouldn’t become a social worker. I would start my own business. And there it was, the truth that I couldn’t avoid any longer. After two years, accumulating over one hundred thousand dollars of debt, and being told, repeatedly, that I would need to shut down my website and my online identity if I was ever going to be a respectable therapist… I made the decision not to become a respectable therapist. I felt the day weighing on me, as I trudged around Portland in the heat. Must attend the conference. You paid for the conference. My heart beat out the old good-girl story: finish what you’ve started, do the right thing – even when it comes at a cost to you. Steadiness over whimsical. Be reliable. 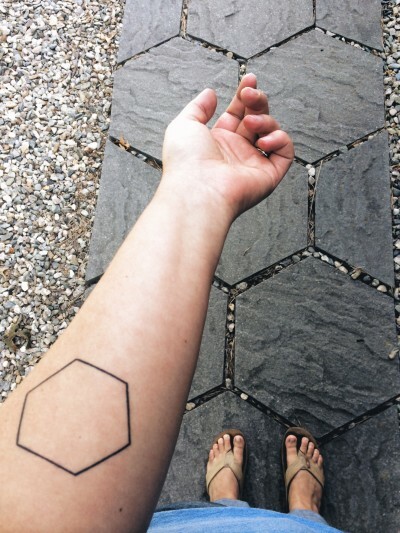 But in that moment it occurred to me that if I didn’t get the tattoo I had been dreaming of, right that second, I wouldn’t be able to understand my body – understand my life. That the permission involved in the act was as much a test as anything else. That I had been accepting no as an answer in so many areas of my life and whittling down my vibrancy. It had been two years since I said goodbye to the life I had always imagined. Two years when I decided to craft a life where I could get a visible tattoo on my arm on a random Saturday afternoon. Two years and I still felt like I had to ask permission – from my partner, from my mother, from the world around me. I still felt like that woman who forfeited her freedom. I felt that old trap of following the path and putting my trust in the way that things had always been done instead of trusting in myself – and in my spirit. This is not how I want to live. I want to live a spirited life, a wild life. A life of my own. So instead of saying No, I said Yes. “It’s the space for the holy spirit, of course. I’m leaving it open.” I laughed. He laughed. I told people that for a while, when I first got my tattoo. Intrigued that people seemed consumed by filling the space, often stopping me to ask me what my plans were for it. Why is it in us that makes us want to fill every open space we see? It’s the space for the spirit, my spirit. It is the reminder of the place where I first felt like a woman, standing solidly within my work, my greatest achievement. It is the space that I am holding open for myself in my own life – to change my mind, to rewrite the rules, to deeply honor my needs even when it is inconvenient and calls for a dramatic renovation of what I know to be true. It’s the space for the holy spirit. Mine. It’s the space to discover myself anew each day. To reclaim my body, my territory. To bloom in my own skin, on my own terms and in my own right timing. In it’s permanency, I feel safety in my own trust deeper than I’ve ever felt anything before. In it’s solid, thin lines, I see the truth and the healing beneath the fantasy of briefcases and 401Ks. I see the bravery that was required to shed that skin so that I could step into my own. I see that though I am and have always been hardwired for survival, I can choose to survive on my own terms. Thrive on my own terms. In it’s permanency, I am reminded of how I want to live. A spirited life with room for messiness and renegotiation.